Klaus is lost and alone. Who, where, why: he knows nothing. Only you can help him find the truth. Join Klaus and K1—a friendly brute—as you navigate this precision based puzzle platformer through a geometric kaleidoscope of pop art, high-contrast worlds. Publisher: La Cosa Entertainment Inc. Developer: La Cosa Entertainment Inc.
Klaus is a precision-based puzzle platformer with a self-aware narrative and unique PS4 touchpad-based controls. Klaus's tight & challenging platforming takes inspiration from hyper-precise classics such as Super Meat Boy & Megaman and combines them with a tense and emotionally engaging narrative akin to those of Limbo and Thomas Was Alone. 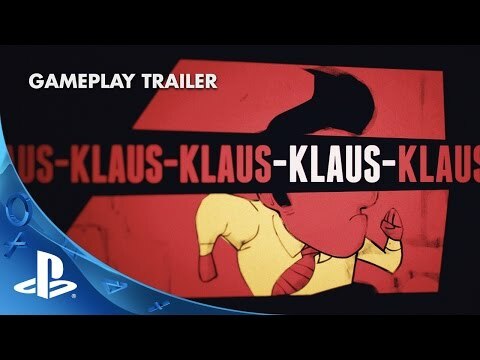 With a minimalistic aesthetic and an electronic soundtrack, KLAUS will appeal to gamers both for its style and unique gameplay experience. Klaus follows an office worker who wakes up in a basement with no idea who or where he is. His only clue is the word "KLAUS" tattooed on his arm. He is forced to escape the mechanical & constructivist world in which he finds himself a prisoner. Along with another playable character called K1—a friendly brute damaged by prolonged imprisonment—he embarks on an existential journey, exploring the idea of the fourth wall and awareness of the player playing the game. 41 achievements to keep you engaged for hours!